Rotten Wood Repair Kits are ideal for the restoration of Windows, Doors and Boats, anything made of wood with a rotten area is an ideal candidate for restoration with a repair kit. These are premium repair kits, comprised of a pair of very high performance two part products. They may appear expensive, but the real cost of any repair is never the materials, and is always the time required to do the job properly (normally proper surface preparation). These kits can make a permanent waterproof repair. Rotten Wood Repair Kits are ideal for the restoration of Windows, Doors and Boats. Anything made of wood with a rotted area is an ideal candidate for restoration with a repair kit. These are premium repair kits, comprised of a pair of very high performance two part products. These kits may appear expensive, but the real cost of any repair is never the materials, and is always the time required to do the job properly. These kits can make a permanent waterproof repair. Do it once – do it right. How will this repair my wood? The CPES will consolidate rotten timber, penetrating deeply into the damaged rotted wood to consolidate and toughen it whilst stopping the rot completely. The Fill-It filler will bond strongly to the CPES saturated timber, offering a permanent flexible repair which is bonded to the underlying wood. Your rotten wood repair will be permanent – the rot will not return. CPES seeks out all of the rotting wood, that which is clearly rotted, and the wood that has just started to rot underneath it. CPES will saturate all of this timber, and the rotted timber will rot no more. The performance of these products at repairing rotten wood is evaluated at WoodRestoration.Com. This kit contains the worlds finest penetrating epoxy. It penetrates deeply and will find all rotten wood. You do not have to carve out all rot. CPES will find the wood that has started to rot underneath the visible, and penetrate that too. The filler is also a two part epoxy. Fill-It flexes with the wood so it won’t crack out over time. Boat hulls may be repaired below the waterline with Smiths Fill-It as it is so waterproof. Fill-It is an aggressive adhesive and will bond permanently to the CPES treated timber ensuring a permanent repair. Colour the filler to match the wood if a natural or varnished finish is required using our colouring kit. The filler will bond permanently to stable epoxy saturated wood. Most importantly the repair will last, saving time and money in the future. Competitor wood hardener products are normally an acrylic (Perspex is a well known brand of acrylic) base dissolved in a solvent. This is a simple, one part product which is optimised for convenience rather than performance. It’s performance does not compare to that of Clear Penetrating Epoxy Sealer, and the acrylic does not bond anywhere near as firmly to wood fibres as the wood derived resin in Smiths CPES. Many of the competitors wood fillers use a polyester filler. You can identify Polyester fillers by the relatively small amount of hardener they contain. They are similar in basis to the body fillers used for car repairs. 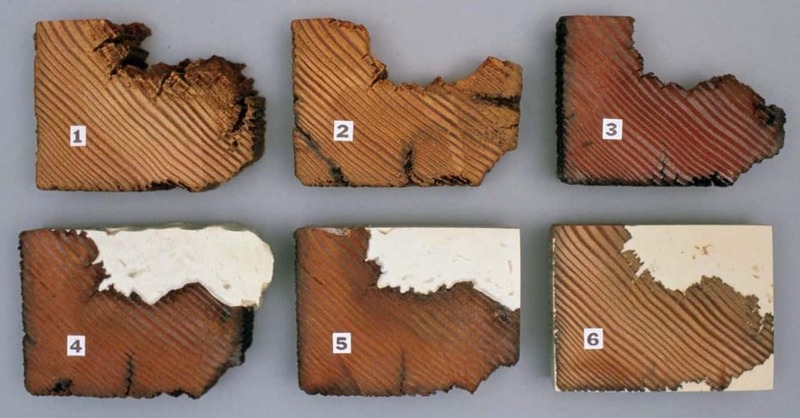 Polyester fillers do not stick as well to wood as epoxy resins, and can have restricted flexibility – leading to failures of your rotten wood repair. We will be conducting some real world testing of common wood repair products performance against CPES and Fill-It in the near future. Check back to see the results. The final finish, whether paint or varnish, will bond thoroughly to the CPES reducing maintenance costs and increasing durability. It is often far cheaper to repair rotting wood than replace the rotted wood with new, and these products will affect a permanent repair that will last. Get a 5% discount by purchasing CPES and Fill-It together as a repair kit. Use Cold Weather formula for treating rotted wood, as it evaporates faster. 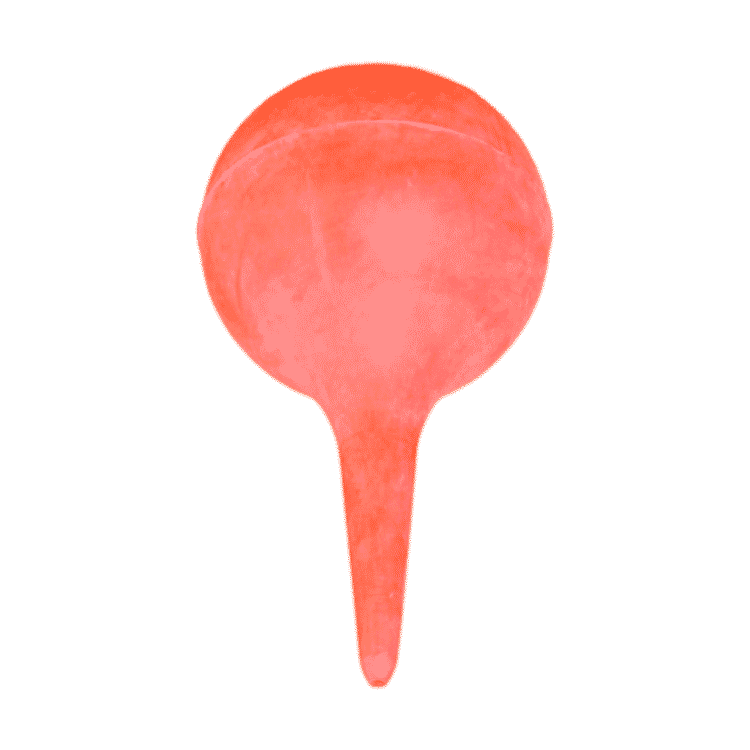 You may use Warm Weather formula if you already have some, or need warm formula for another purpose as well, however it will take longer for the solvents to evaporate. Apply multiple coats within one day if the solvent smell has dissipated. Keep mixed CPES covered between coats. Deep areas of rot can have holes drilled into them to assist getting CPES deep into the section of rotted timber. Use our CPES injection syringe to apply CPES to areas of deep rot with poor access such as rotten timber joints in window frames. The Injection syringe is invaluable for application of CPES to a precise area. Areas with rotted end grain will absorb a lot of CPES during restoration..
CPES that dries with a sheen indicates that the rotting or rotten wood is saturated, and will absorb no more. Allow 24 hours to dry and partially set after the final coat. There should be no solvent smell and the surface should be firm to the touch. Large sections of rotted timber can take much longer for the solvents to evaporate, as they will absorb much more CPES into the rot. Moving air with fans can speed this process. Now mix and use the fill-it filler to restore the profile on any rotten areas removed during preparation. Force Fill-It onto the substrate using a scraper or palette knife to thoroughly wet the substrate and ensure good adhesion. Add filler to restore missing material after wetting the surface. Colouring Kits are available if required and may be used to colour the filler to the colour of the damaged wood to allow varnish or clear finishes to be applied. 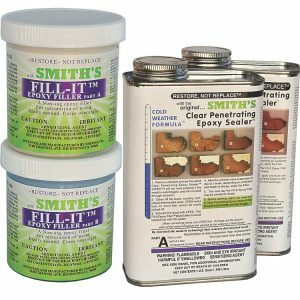 Full details on Fill-It, including thorough mixing instructions can be found on the Fill-It Flexible Epoxy Filler. Allow the filler to set before any final finishing. Finish the Filler by carving or sanding. Each kit includes comprehensive instructions between the two cans of CPES. If you have specific problems, such as nail rot, we can advise you on how best to deal with those. Please contact us for assistance if this is the case. 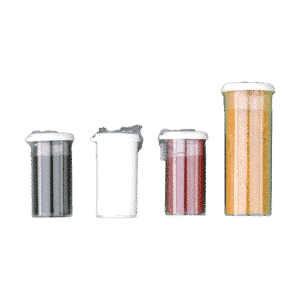 What sizes of CPES and Fill-It do I need? 1ml of Fill-It fills a void of 1 cubic centimetre. Fill-It Epoxy Filler does not shrink on curing. 1cu inch is 15 cubic centimetres, ml or cc’s. I include imperial measurements as I find it far easier to calculate volumes of cracks etc in inches. Examine your hole after you have removed any loose rotten timber as described above. 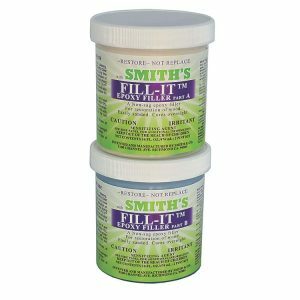 Unless you plan to use the entire pack of Fill-It at once you must use two separate tools to remove part A and part B from their containers. CPES use is very hard to accurately estimate as it is impossible to judge the porosity of rotten timber by eye. New softwood or ply will consume around 1 litre per 5 sq metres. Hardwood coverage may be up to 10 sq metres / litre. If you are reading this you are very unlikely to be considering new wood coverage however. Treat rotten wood using cold weather formula as it evaporates faster. Seriously decomposed rotted timber, soft to the point where you can push your finger through it, will consume up to 3 times the volume of the timber to harden it fully. However this will harden mush to a rock hard piece of epoxy around some cellulose fibres. Less badly rotted wood will of course consume less. It’s nearly impossible to estimate accurately how much any piece of well rotted timber may consume without trying the CPES on the actual timber during rotten wood repair, but if you estimate the same volume of CPES as obviously softened rotten timber that is as good a starting point as any. The most accurate means of estimating the CPES requirements of your rotten wood is to trial it on an area. The aim is to saturate the rotted timber to ensure adequate penetration. If you are unsure how much you may need – buy more and return unused items to us for a refund. What About The Rest Of My Old Window Frame? While repairing a rotten section of any exterior wood item, if the entire exposed surface is cleaned back to bare wood (and dried if it is damp) it can be sealed with CPES whilst the repaired area is being restored. This treatment will seal the exterior surface of the wood permanently against the elements, particularly protecting end grain and vulnerable areas of the item. 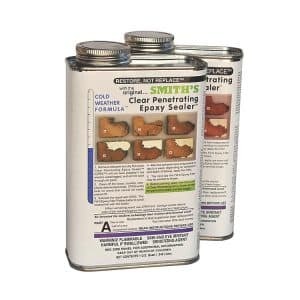 Smiths Clear Penetrating Epoxy Sealer is a fabulous adhesion promoting primer. Traditional solvent based paints adhere very strongly to it. Modern Micro-porous paints work very well over CPES as it leaves a breathable finish. Smiths CPES bonds the uppermost fibres together in the timber. This provides a stable base for the topcoat that resists the formation of rot under the topcoat. Clear Penetrating Epoxy Sealer forms chemical bonds with a topcoat applied while the CPES is still curing. The CPES literally glues the topcoat down to the wood with epoxy strength! If you are unsure of which temperature CPES you require, click here. For details of the use of CPES as a primer click here, wood hardener (consolidator) and rot restorer, see here. 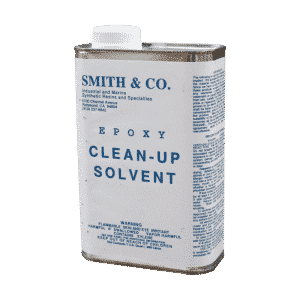 The rot doctor has just concluded some 5 year exposure testing of Smiths CPES, click here to view Rot Doctors 5 Year exposure test. I have used a small repair kit on an outdoor beam at the bottom of a rather flimsy construction of wooden slats which forms the ‘wall’ of a small conservatory. I followed the instructions as far as I could, although I was unable to remove the old paint in some places. I am very pleased with the result and the repair has survived the winter very well and no more leakage. The Product is exactly what it promised to be and I hope the repair will continue to last a long time. I would also like to say that you have been very helpful to me on the phone, thank you. Many thanks for your kind words Mariann. Good customer service is highly valued by us – hope you get many more years from the repair. Once set (and it needs a reasonable temperature as very cold days means it takes more than 24 hours) it can be carved and sanded. Leaves a super finish for painting. First impressions are; this product is really a very, very good one. I have used these products for over 20 years. I know the inventor personally as I had a warehouse next to his in Richmond, CA. I used to go into his shop to purchase and to discuss bonding mechanisms and restoration methods. I know the science behind these products is solid. I know they work. My review is about this company, Make Wood Good. I recently moved to Europe and thought it might be more difficult to get these products. Thank God I found Make Wood Good. I had a problem with the payment method at first, but the owner called me directly and fixed it right away on the phone and sent me the products quickly and professionally. What more do you want? Friendly service the way it should be is exactly what I received. I will purchase exclusively from this company as long as I am in Europe. If you find somebody solid and good… stick with them!!! Wood filler. 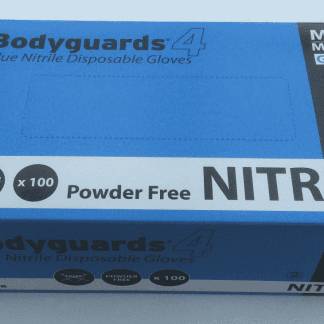 This is an excellent product – really helped us restore our ancient, but loved windows. Easy to work with – we would advise however that during a heat wave, you get less workable time than on a cooler cloudy day! Sealer & Filler. Only time will tell but if using these products on some early rot in my window frames cures the problem then 5 stars would be well deserved. th sealer/hardener was easy to apply & appeared to penetrate well. Unlike other epoxy based products it was slow to cure giving it time to penetrate deeply. The filler was quite easy to mix & apply even to vertical sections. Once again its slow cure allowed time to squeeze it into difficult timber sections. once set it is very hard but capable of being cut & sanded rather like a hardwood. So far I am very impressed & have recommended it to others including a local builder. Amazing Product. I purchased the small repair kit to repair the base of a load bearing strut support a small gable window that had partially rotted. These products are amazing, customer support is second to none, even on a Sunday. Followed they instructions to the letter and the repair is as good as the original. I was pondering whether to purchase because of the cost, but I can assure you this is well worth the money. The only other alternative was to remove the base of the strut and splice in a new piece which would have been difficult and expensive.